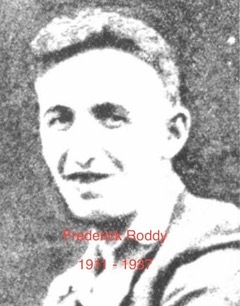 Frederick Roddy (25), 51 Poolsbrook Road, Duckmanton, leaves a widow, but no family. Born in Mosboro’, he went to live at Duckmanton seven years ago, since when he had worked at Markham Colliery. He used to be in Eckington Band and took part in a contest at Leicester. He was a keen motor-cyclist. His widow has received a double blow, for Cadywould, another of the dead men, was her cousin. Mr Roddy was the son of the late Sgt F Roddy. When he went to Mosbro’ C. of E. School he was a member of the school football team. For six years he was in the 1st Mosbro’ Troop of Boy Scouts. The internment took place in Staveley Cemetery, following a service in Staveley Parish Church. The Rev. H.H. Dibbera officiated. Mr. H Kirk (representing the Staveley Company) was present in church.